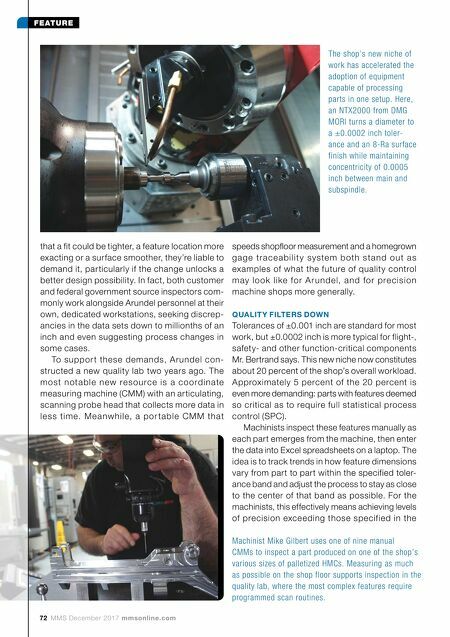 72 MMS December 2017 mmsonline.com FEATURE that a fit could be tighter, a feature location more exacting or a surface smoother, they're liable to demand it, particularly if the change unlocks a better design possibility. In fact, both customer and federal government source inspectors com- monly work alongside Arundel personnel at their own, dedicated workstations, seeking discrep- ancies in the data sets down to millionths of an inch and even suggesting process changes in some cases. To suppor t these demands, Arundel con- structed a new quality lab two years ago. The m o s t n ot a b l e n ew re s o u rc e i s a c o o rd i n ate measuring machine (CMM) with an articulating, scanning probe head that collects more data in l e s s tim e. M e a nw h il e, a p o r ta b l e CM M th at speeds shopfloor measurement and a homegrown g a g e tr a c e a b i l i t y sys te m b oth s t a n d o u t a s examples of what the future of quality control m ay lo o k like fo r A r u nd e l, a nd fo r pre c is io n machine shops more generally. QUALITY FILTERS DOWN Tolerances of ±0.001 inch are standard for most work, but ±0.0002 inch is more typical for flight-, safety- and other function-critical components Mr. Bertrand says. This new niche now constitutes about 20 percent of the shop's overall workload. Approximately 5 percent of the 20 percent is even more demanding: parts with features deemed so critical as to require full statistical process control (SPC). Machinists inspect these features manually as each part emerges from the machine, then enter the data into Excel spreadsheets on a laptop. The idea is to track trends in how feature dimensions vary from part to part within the specified toler- ance band and adjust the process to stay as close to the center of that band as possible. 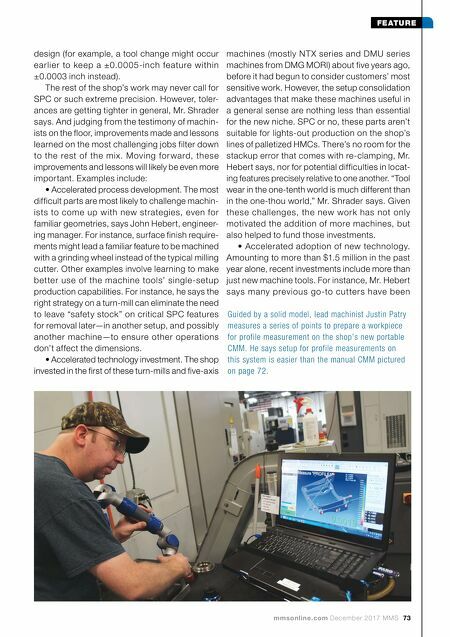 For the machinists, this effectively means achieving levels of precision exceeding those specified in the The shop's new niche of work has accelerated the adoption of equipment capable of processing parts in one setup. Here, an NTX2000 from DMG MORI turns a diameter to a ±0.0002 inch toler- ance and an 8-Ra surface finish while maintaining concentricity of 0.0005 inch between main and subspindle. Machinist Mike Gilbert uses one of nine manual CMMs to inspect a part produced on one of the shop's various sizes of palletized HMCs. Measuring as much as possible on the shop floor supports inspection in the quality lab, where the most complex features require programmed scan routines.